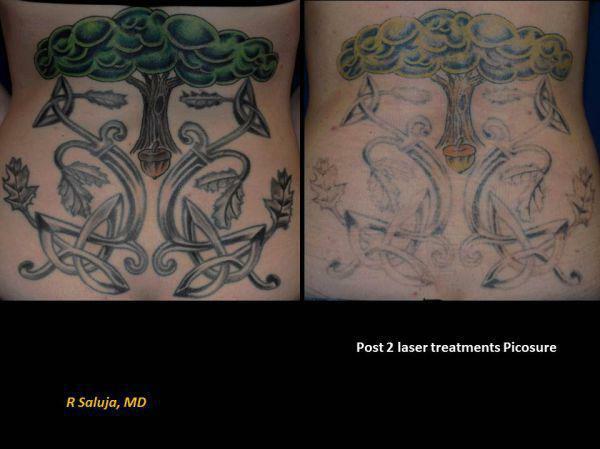 With the advent of picopulsed technology, laser tattoo removal took a large step forward. While multiple treatments are still indicated (based on location, ink density etc)., picopulsed technology outweighs nanosecond technology. 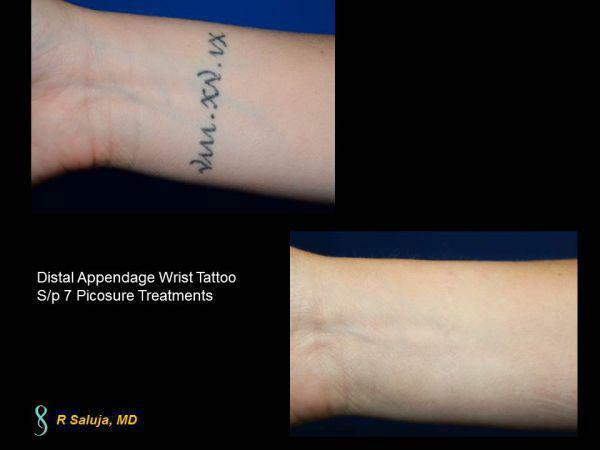 This is a patient with laser tattoo removal treatments in progress to the ink on her arm (a distal extremity which typically takes longer to clear). This is status post 2 treatments with nice clearance of the ink being seen. Male pattern balding can lead to loss of hair at the crown. The use of ink in a feathered technique can restore the the look of hair. 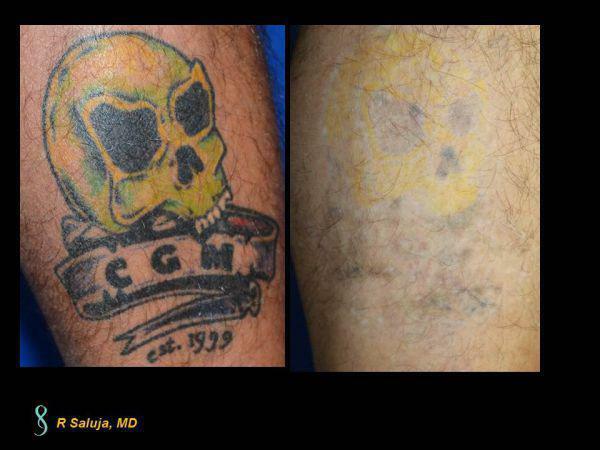 This patient, however, did not like the look so decided to have the tattoo ink removed. This is status post one treatment with Picosure Laser. 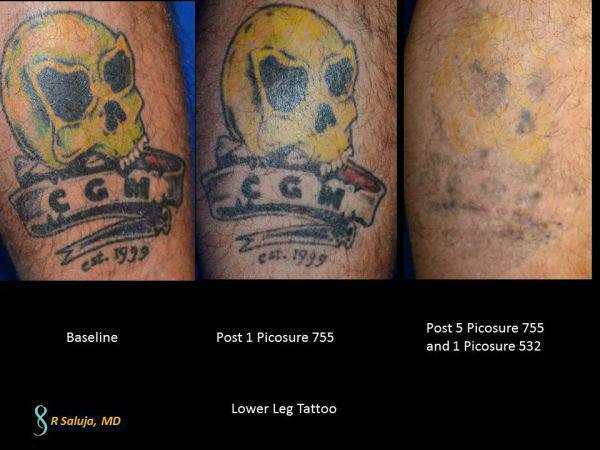 This Huntersville, North Carolina patient was bothered by a leg tattoo which had multiple colors. We treated him with a 755 nm Picosure Laser. The green coloration faded to yellow and we then used the Picsosure 532nm wavelength to clear the residual yellow color. We separated appointments by at least 3 months since the tattoo was located on a distal extremity. 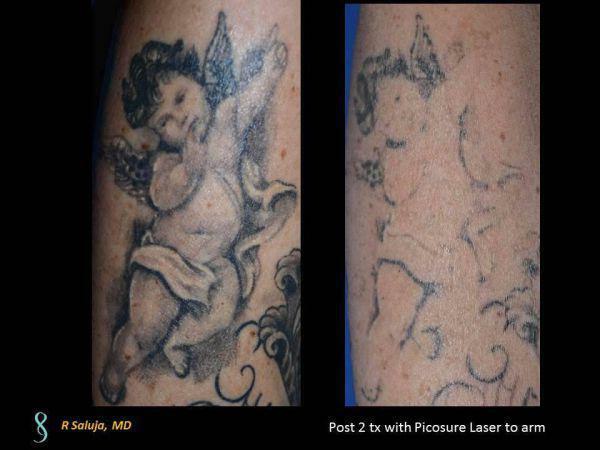 With the advent of picopulsed technology (Picosure being the first laser to receive FDA clearance with picopulsed technology), the removal of tattoos took another step forward from QSwitched days. 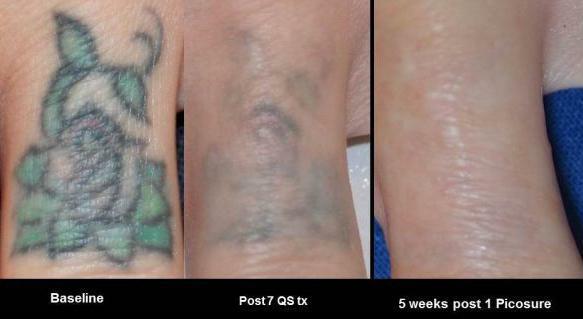 Most QS lasers for tattoo do not utilize the 755 nm Alexandrite wavelenght. Picosure is the only picopusled technology that does. What does that mean? 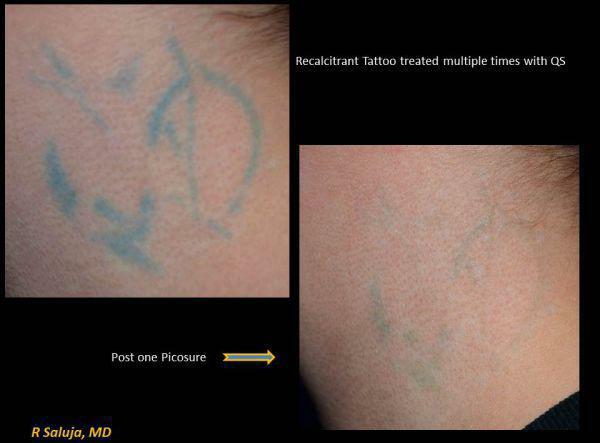 It means that patients in the Charlotte, North Carolina area that have blue/green/aqua colored tattoos that were unable to be removed adquately now can have a Picosure treatment to help reduce the ink. While it does still take several treatments depending on the ink density, location etc, there is marked difference in the amount of lightning when utilizing this technology. 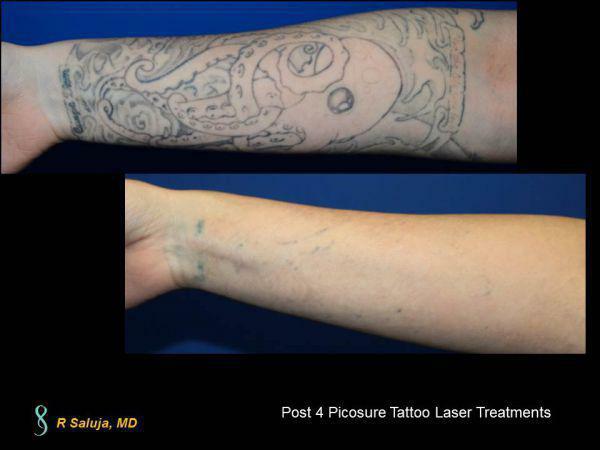 Picosure Laser for Tattoo removal has revolutionized tattoo removal by using pulses that are in the trillionths of a second. The distal appendages such as the hands/feet are the hardest area to clear away. This is a Charlotte, North Carolina lady who had a black tattoo on her wrist that had heavy ink density. After 7 sessions, her wrist ink has cleared and the underlying skin looks like her surrounding skin. 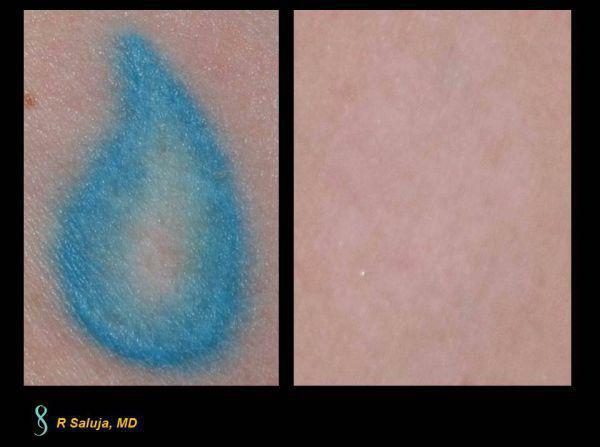 This patient had 17 treatments with a QS laser several years ago and while the ink lightened, there was still a hue of color that would not budge. 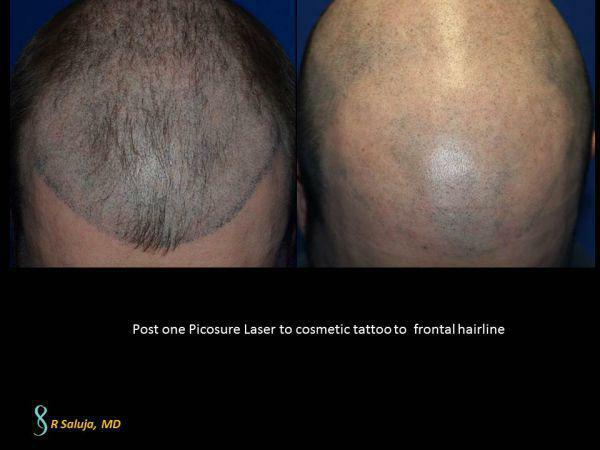 Status post one Picosure Laser Treatment, the reduction of ink for this North Carolina gentleman was obvious. Here is a lady with a blue tattoo. This is status post 2 treatments with the Picosure Laser. One of the hardest tattoo colores to treat is yellow and one of the hardest areas is on a distal appendage like the leg. This Charlotte, North Carolina gentleman had a multi-colored tattoo that is progressing nicely with the Picosure Laser. In Charlotte North Carolina, we are seeing very large tattoos, ones that cover the entire back, sleeve (arm) or even torso. While it is a good idea to split the tattoo in half so that it is easier for the body to clear, often times it is hard to get back to have the tattoo retreated. This patient is status post two treatments to her entire back. When I do large tattoos, I typically like to wait around 10-12 weeks prior to retreating. Yellow ink can be very difficult to remove. 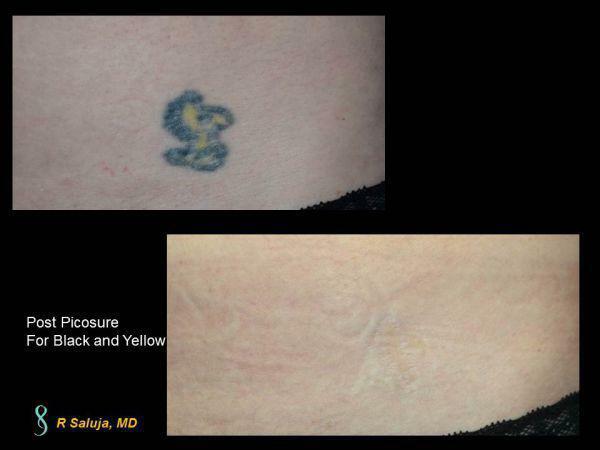 Utilizing the Picosure Laser with a 755 nm wavelength for the black ink and the 532 nm wavelength for yellow ink, this patient has shown substantial clearance. The tattoo is over an area of striae (stretch mark) which can be more difficult to clear. 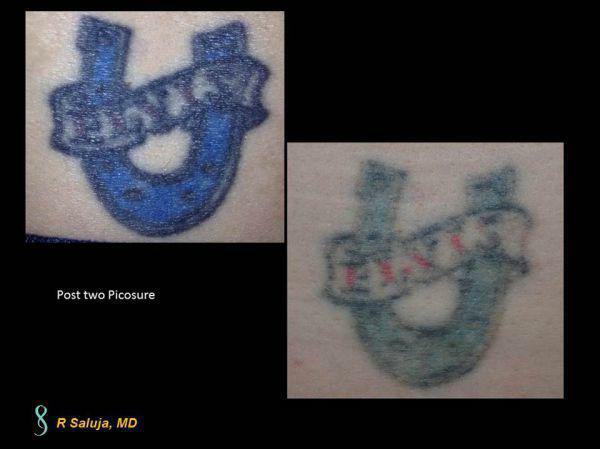 When we discuss tattoo removal for patients, it is first important to tell them not to be tan, as higher laser settings can be utilized when they are not tan. It is also important to show patients that where the ink is darker, these areas will take more treatments to remove the ink and when it is shaded, the ink can be removed with less treatments. This is a Charoltte, NC patient who is status post 4 treatments to a sleeve tattoo, showing great progress with the Picosure Laser.